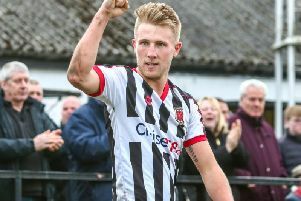 On-song Chorley completed a hat-trick of 2-0 home wins as they continued their excellent home form with just one defeat in eight games this year. Matt Jansen’s buoyant side are unrecognisable from the one which frittered away points in several autumn home games. Now just four points away from a play-off slot, they may yet gatecrash the promotion showdown. Galvanised by the non-stop running of Jake Cottrell in midfield, Chorley proved too strong for Curzon. They boosted by a goal after two minutes and a second goal just before the interval effectively settled the issue and though Curzon enjoyed plenty of possession in the second half they were unable to break down an uncompromising Chorley defence. Darren Stephenson in prime form initiated the early goal. He burst clear on the left and hit a fierce drive which the diving Hakan Burton could only parry and Jordan Connerton was on hand to head the loose ball into the empty net. As Chorley kept piling forward, Burton twice rescued Curzon by racing from goal to nick the ball off the toes of the marauding Connerton and Stephenson. The visitors’ best reply was a powerful Niall Cummins free-kick which skimmed the bar. But the danger continued to come from Chorley and Burton arched himself to tip over a rasping shot from Stephenson. The pressure told on 43 minutes when an under-hit Dale Whitham corner reached Adam Roscoe at the edge of the box and he celebrated his 300th appearance for Chorley with a magical piece of finishing, leaving Burton standing with a sweetly-struck half-volley. The second half was a tepid affair by comparison and neither side created much up front, though Whitham should have rubber-stamped Chorley’s victory when Jack Lynch’s pinpoint cross left him with a free header which he could only direct at Burton.